Kirk Douglas ... Paris Pitman, Jr.
Woodward Lopeman: Don't tell me you can't make speeches; you could talk a coyote out of a chicken. My commentary refers to minor elements of the plot of the film in question, revealing, to an inconsequential extent, some of the events of the movie. Some may interpret this as a SPOILER, but I am very careful not to expose anything specific crucial. 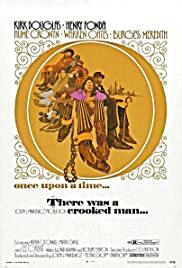 Similar to "Paint Your Wagon" (1969) in it's use of a comedic western as a vehicle for social commentary, "There Was a Crooked Man" has a comic tone at times, but has difficulty being consistently one kind of movie: Is it a satire? Is it a comedy? Is it a bawdy western with a serious disguise? Is it a social commentary about the penal system? Is it an arc for Fonda's upright and uptight sheriff to find disillusionment? Kirk Douglas portrays a robber who will sacrifice anyone and anything to get the loot and come out on top, while Henry Fonda is a town sheriff who seems the exact opposite of Douglas, and who specializes in moral correctness. While attempting to practice what he preaches, kindness before cruelty, Fonda is shot apprehending a drunken Warren Oates. The town quickly and easily gives up hope in Fonda's ability to do his job, leading Fonda to volunteer as warden for the prison where both Douglas and Oates are incarcerated. Fonda begins a crusade to uplift the inmates of this desolate Arizona penal colony by abolishing obligatory hard labor and restricting cruel punishments upon the men. It seems the only way to earn Fonda's enmity as warden is to draw lascivious pictures of scantily clad women, as all other crimes are forgivable and reformable in Fonda' eyes. 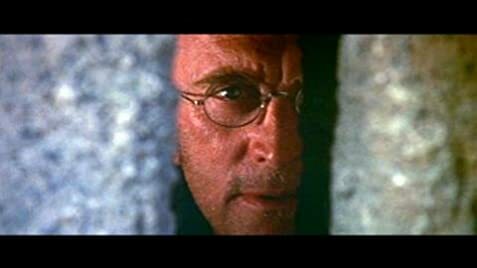 While Fonda is trying to teach the prisoners self-respect, Douglas is luring them into his aid with promises of sharing the money he stole in the crime for which he was convicted and sentenced to the prison. Those he can't persuade he tricks into helping him by various plots and devices, all the while Fonda thinks Douglas should become the prisoners' leader and help give them hope by improving their living conditions. Burgess Meredith frequently steals the spotlight as a former flashy train robber that has been transformed by years in prison into a tired, gritty, petty old man who does nothing for free. The problem with this movie is not the excellent acting, but the tone and the Mickey Mouse musical score. It deals with murder and betrayal carelessly, it refers to revenge and cruelty with humor, and it moves back and forth from serious to light-hearted scenes so quickly and easily that it becomes difficult to maintain any clear perspective. In the middle of a murderous rampage an (apparently) hilarious food fight ensues while a buxom visitor to the prison is gradually, but incompletely, disrobed. Unlike other satires released that year such as "Catch-22" (1970) or "M.A.S.H." (1970), "There Was a Crooked Man" doesn't succeed in delivering a message, but only appears to chronicle an improbable series of events that have no meaning outside of itself, all the while the most irritating and thematically contrary music imaginable scores nearly every scene. Despite good acting and some laughs, it's a tough film to recommend. If there was a DVD version that allowed you to keep the dialog and eradicate the music, this would be a totally different, and much improved, movie. 33 of 47 people found this review helpful. Was this review helpful to you?